When traveling down Stanton or McCandless Avenue towards Lawrenceville, the viewscape is tremendous – from the natural beauty of the Allegheny Cemetery, to the Allegheny River Valley, or even the stately cityscape of Downtown Pittsburgh. Unfortunately, a less sightly view is the aging corrugated aluminum retaining wall and graffiti-covered, crumbling staircase. at Stanton & McCandless. 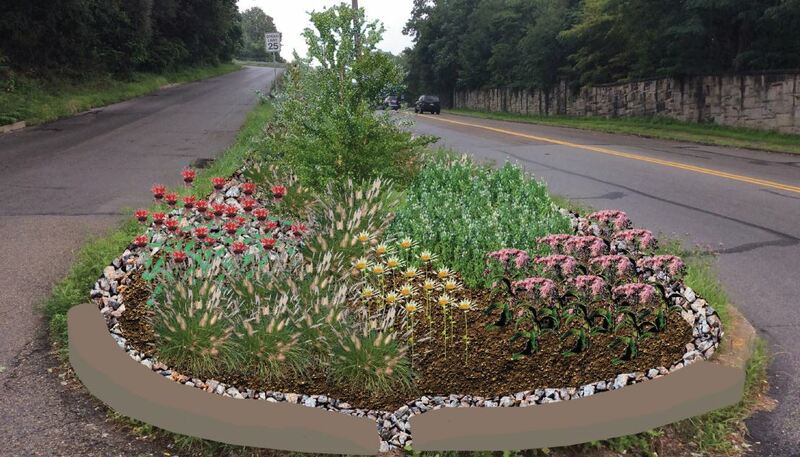 Rendering of rain garden between Stanton & McCandless Avenues courtesy of Penn State Center for Design. The SHNA Green Committee, who recently completed a project at the gateway to Stanton Heights from Morningside are now focusing their attention on this lot and the entrance to the community from Lawrenceville. Over the summer, we commissioned students with the Penn State Center for Design to produce plans that would turn this property into something both beautiful and environmentally beneficial. 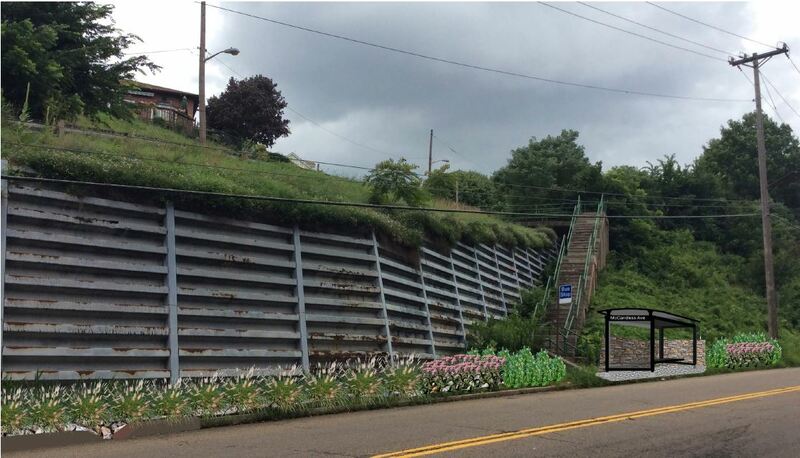 The plans, available for download below, call for the installation of rain gardens along the top and bottom of the hillside, along with anchoring beds that create a welcoming gateway between Stanton Heights & Lawrenceville. Rain gardens use natural plant species that can withstand large amounts of water and nutrient concentrations to absorb rainfall and stormwater runoff. Addressing stormwater runoff in this location should help with the flooding and icing conditions along the roadways, in addition to being a part of larger citywide efforts to reduce stormwater flow into the sewers. We plan to make this project one of many springing up throughout the city to contribute to meeting County and City goals to reduce sewage overflows. In addition to reducing stormwater, the project will prevent the spread of invasive species along the hillside and hedge against the further erosion of the hillside. To get the project underway, the Neighborhood Association has applied for a Love Your Block grant from the City that could fund the first phase of project implementation as soon as May 2016. This phase will begin installing rain garden beds consisting of little blue stem and prairie drop seed grasses, and perennials including varieties of columbine, tickseed, coneflower, daylilies, and black-eyed susans. In addition to beginning to implement the rain gardens, the grant would also provide city assistance for graffiti-removal along the city steps leading down to the bus stop on Stanton Avenue, painting the stairway railings, and beautification of the aging retaining wall that is an eyesore. Once grant recipients are announced, we will be recruiting volunteers for our project date in mid-May. Other funding sources we will seek in the coming year are a Green Infrastructure Grant through the Pittsburgh Water and Sewer Authority (PWSA). Last year, the Green Infrastructure program funded 17 projects around the city, and we believe that this project is competitive for the next grant cycle. If you are interested in volunteering on this project or others like it, come to our next community meeting on November 18th (6:30 pm at Sunnyside Elementary) or reach out to our green committee chair Lissa Geiger Shulman at lissa.geiger@gmail.com. Stanton Heights never looked so beautiful (and it did when I was growing up in it in the 1960′ and 1970’s) till now so congrats to those who are committed to making it beautiful and keeping it that way! And a huge thank you to all of us who grew up there decades ago. This would improve our neighborhood drastically! Love the idea.